It does not hurt to be corrupt! Assume that the rent payout is Rs 100,000. Assume that the probability of a corrupt official getting caught is just 10% (a good approximation if we take the full career of officials even in the more corrupt departments). Assume also that only 25% of those accused of corruption actually end up being punished. And of those punished, it is not unreasonable to assume that just 10% get dismissed from service (in fact the actual number would be insignificantly small, or infinitesimal), while the rest escape with administrative penalties like cut in increments or reduction in ranks, all of which have the effect of reducing their salaries. One of the important points to be borne in mind is that unlike other forms of theft and pilferage where it is easy to recover the booty, it is almost impossible to recover the rents collected by the officials. Therefore, whatever has been amassed is more likely to remain with the official. Further, except in cases where departmental materials have been diverted or government funds have been mis-appropriated, the major share of corruption cases involve taking bribes or personal favors for doing official functions. It is not practical nor possible to reverse such favors even if the employee is punished. In other words, the punishment only imposes an administrative penalty. Let us make the following assumptions. We can assume a rent payoff of Rs 100,000. Assume that the financial implication of the reduction in salary is small enough to be irrelevant over the career of the official (a typical one or two increment cut in salary, with cumulative effect, has only marginal impact). Assume that the bribe required to get himself out is half the rent gained, or Rs 50,000. Assume that the environment has become so permissive that the peer-group stigma of being corrupt is minimal. Assume also that the salary foregone if dismissed is ten times (and at higher levels of the officialdom, the reverse is the case!) the rent gained, ie Rs 1000,000. As can be seen, the expected pay-off from taking a bribe of Rs 100,000 lakhs is salary + Rs 93,750. Now you decide whether to be corrupt or not! 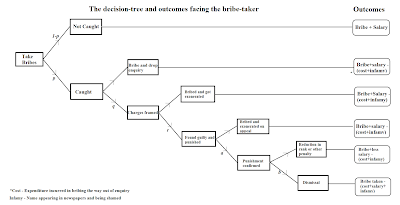 A cursory examination of the extant administrative processes on disciplinary action would reveal that each of the probabilities - p, q, r, a, and b - are far closer to zero than one. 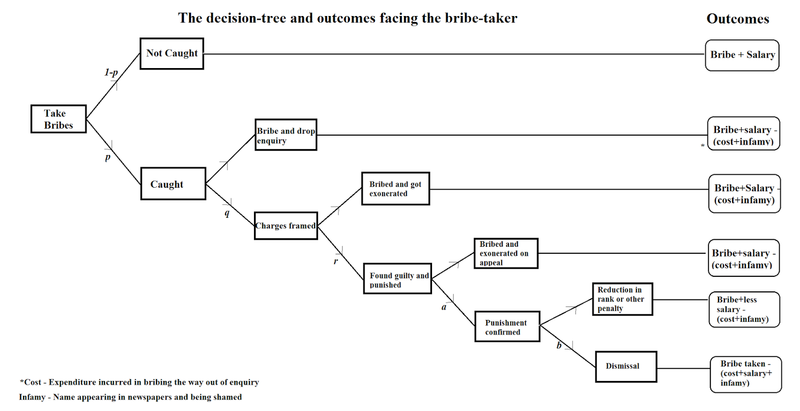 Given this, the likelihood of the biggest punishment of a person being caught taking bribes and dismissed from service is (p)(q)(r)(a)(b), an infinitesimally small chance. In any case, the administrative processes make establishing a corrupt practice very difficult. And, even when caught, the current processes leave pretty much the whole share of the rents captured by the official in tact. So, given the stakes involved, if you do not mind the infamy and can manage the inquiry process (not very difficult), it clearly pays to be corrupt! The probabilities and cost at each stem vary based on how strict the officer concerned with the task is. The financial tech startups are trying to evaluate credit risk using a wide variety of consumer data including the digital footprint of customers arising out of social networks, ecommerce, mobile usage and geo-location. For example, IndiaLends claims to capture alternative information points such as bank statement, utility data, social data and customer interaction with the website... Startups like IndiaLends do not lend money of their own. Using their technology platform, they connect consumers with banks and financial institutions which results in better rates for the borrowers and a reduction in overall default rates... where they differentiate... from the bank is in scientifically matching the right borrower profile with the most relevant lender and hence reducing inefficiencies that lead to lower loan approvals, higher interest rates and sub-optimal loan amounts. 2. The most obvious indicator of state capability weakness is the gross inadequacy of personnel in many critical public agencies. As against a global average of one policeman per 450 people, India's has one for 709 people, with the numbers being 1298 and 1282 for Bihar and UP respectively. The problem here is that any discussion on increasing personnel strength gets conflated with the mistaken belief that the government is already too big and needs to be pruned down. Robots have begun to take over an array of functions from humans at car plants in India. Volkswagen India has 123 robots at its Pune plant while Hyundai Motor India, the subsidiary of the Korean carmaker, has 400 robots at its factory in Chennai... The Ford Sanand plant actually has 453 robots in the shop floor, with up to 90 per cent of the work automated... The entire body shop, most of the paint shop and parts of the final assembly line in these plants are now automated. Robots are performing functions ranging from welding to foundry operations to laser applications. According to an a 2013 survey by Associated Chambers of Commerce and Industry of India (Assocham), titled "Business of Private Coaching Centres in India", the size of the private coaching sector was $23.7 billion, or Rs 1.41 lakh crore. The survey also predicted that by 2015, it would grow to $40 billion, or Rs 2.39 lakh crore. The survey had collected data from 5,000 students and parents across 10 cities. It revealed that 87 per cent of primary and 95 per cent of high school students in the major cities took private tutoring. This industry grew by 35 per cent in the previous six years. 6. Global corporate bond offerings have crossed $2 trillion for the fourth consecutive year on the back of continuing monetary accommodation and signals that the ECB may be willing to continue and expand the ongoing QE. The Sahwa movement comprised a group of Iraqi tribesmen that collaborated with the US a decade ago to root out the Iraqi branch of al-Qaeda. That branch took its revenge: it eventually became the Islamic State of Iraq and the Levant, better known as Isis... Isis seems obsessed with al-Qaeda, from which it split in 2013 following disagreements over the goals of jihad in Syria. Since then Isis has distinguished itself from its parent through its savagery (there is no limit to the violence it is willing to inflict) and its move to create a caliphate in parts of Iraq and Syria. The group has taken over the collection of car-registration fees, and made students pay for textbooks. It has even fined people for driving with broken taillights, a practice that is nearly unheard-of on the unruly roads of the Middle East. Fines are also included in the punishments meted out for breaking the strict living rules imposed by the Islamic State. Ultimately, though, many officials and experts said the Islamic State would probably be able to cover its costs even without oil revenue, and that so long as it controls large stretches of Iraq and Syria, including major cities, bankrupting the group would take a lot more than blowing up oil tankers. “These are all going to be little pinpricks into Islamic State financing unless you can take their revenue bases away from them, and that means the territory they control,” said Seth Jones, a terrorism expert at the RAND Corporation... the old strategy for stopping the flow of money to terrorist groups like Al Qaeda, which was largely based on cutting them off from donors in the Persian Gulf upon which they depend, does not apply to the Islamic State. 9. The $160 bn reverse takeover of US-based Pfizer (maker of Viagra) by the Dublin-based Allergan (maker of Botox), an investment company trading pharmaceuticals businesses, is classic tax-inversion. It enables Pfizer to use its accumulated overseas profits without incurring US tax liability, thereby saving atleast $21 bn in future tax liabilities. It also joins Burger King and Liberty Global as brands which have fled overseas to avoid tax payments. Pharmaceuticals companies used to be research enterprises that discovered and developed drugs. Then they became marketing giants, skilled at selling as many blockbuster pills as possible. Lately, they have turned into mergers and acquisitions machines, buying and selling medicines invented by others. It is hard to view their evolution as progress... Instead of taking their chances by investing in drug discovery themselves, some wait until a smaller biopharmaceutical enterprise has done so and then try to buy the rights. It is less risky and uncertain for investors but it also tends to be extremely expensive. AbbVie, for example, paid $21bn for Pharmacyclics this year, largely to acquire a single blood cancer treatment. In this case, Pfizer is buying up Botox! 10. Finally, the ECB has extended QE, but not by as much as anticipated. Apart from extending its 60 billion Euro a month bond buying program for another six months till March 2017 or "beyond" and purchase municipal bond in addition to government bonds, it has also lowered the deposit rate to minus 0.3 per cent. Should you prepay your home loan or invest the money? The home loan EMI is divided into interest and principal repayment, and the proportion of each changes over the years as the interest component falls and the principal rises. So, if person prepays the loan, he will find a large amount of principal still outstanding, while the interest would already have been paid, assuming full term. When a loan is paid in part, the EMI for the remaining period is reworked. However, this is also based on the assumption of a full-term repayment, where the interest is front-ended. person might find that repaying the loan will shrink his personal balance sheet since only the house will remain as an asset. If, on the other hand, he invests the money, his asset base will diversify and become bigger. Given the stability in the income, person should have no problem paying the EMI. If there is a risk, he will not need to sell the house, but can sell the investment to repay the loan as required. person should ensure that his investment does not grow at a rate lower than the one paid on the home loan interest. He should also ensure that the money is kept in shares, mutual funds or other instruments, which can be sold when required. The investment can appreciate over time and be available for other needs compared with the investment in house, which is not flexible and cannot be used as required.